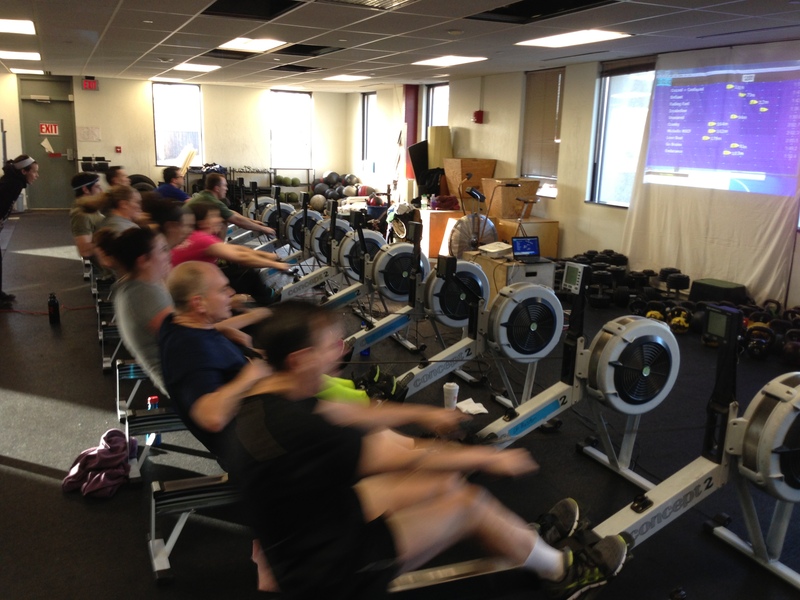 Competitors crushing the 2k at the Third Race of the Renegade Rowing League! We attacked this Rowing WOD in December. Look back at your results and see if you’re ready to step it up another notch. This is a great opportunity to focus on a few tactical aspects of the 2k and get in some solid race pace work. Try to keep a consistent pace over all 8 or “negative split” toward the end if you’re feeling good. Negative splitting means you pull a faster split than you did the last piece. My goal was 1:40×2, 1:45×2, 1:50×2, 1:45×2. This would be better than the last time we did this as well as a 7:00 2k which is my ultimate goal. Solid execution Larry! Great start and good finish! Larry how did you manage on the weight last week? Held steady. Took my wife to a nice dinner and went backwards. Had to fight real hard just to get back even. How bout you? Based on the last time we tackled this, my target splits were 1:44.5 for the first two pieces and 1:49.5 for the remaining six pieces for an overall 1:48.5/500m. Totals: 14:22.7, 4000m, 1:47.8, 30 s/m. As always, I could be more disciplined about settling to my target pace, but I’m definitely getting the hang of it! Shaved quite a bit of time off the splits from the last time we did this. Hit the earlier pieces harder so the final 2 segments I was gassed a bit but held to about the same times as last time. Awesome Chris! Way to push it at the end! Hi Pat & RR league! I’ve been following the rowing wod’s and doing them on my own a few times a week. I did this one on 12/21, and re-tested this morning. I’m motivated by my improvement over the past month. I may not be a speed demon, but I’m definitely better at keeping consistent pace throughout, and a wee bit faster now compared to then. Thanks for posting great wods, Pat 🙂 Can’t wait for the CRASH-Bs.